Physics and environmental studies professor Sarah Sojka, Tyrah Cobb-Davis ’19, and Libby Exline ’19 construct artificial seagrass. Earlier this summer, Tyrah Cobb-Davis ’19 and Libby Exline ’19 looked like they were going on a diving expedition. They packed wetsuits and swimming goggles into a car before loading up the most important item—a large, black mass of intertwined plastic tubes, or artificial seagrass. For their Summer Research project, the students are working with physics and environmental studies professor Sarah Sojka to build and install the artificial seagrass along Virginia’s southeastern shore. Seagrass is totally submerged vegetation and is known as an ecosystem engineer that provides many benefits to the environment. And although the global population continues to decrease, there has been some success in bringing it back in the Chesapeake Bay area using the fake plants. 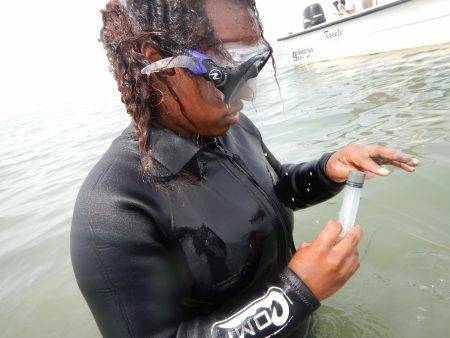 Tyrah Cobb-Davis ’19 studies a water sample. At Randolph, Cobb-Davis and Exline have been analyzing data from other restoration efforts and constructing more artificial seagrass using polypropylene plastic, which is easy to cut, buoyant, and bends similarly to real plant. In June, they traveled to Cobb Island, where they worked alongside other college students from across the nation to install new artificial seagrass beds and examine the effects of existing ones. Exline, who is an environmental studies major and grew up near the coast of Maryland, was eager to conduct this kind of research. Libby Exline ’19 examines a seagrass bed off of the Virginia coast. Cobb-Davis is a physics major who recently discovered a passion for environmental work. “I’ve had an opportunity to participate in some great projects and to take different classes in environmental science, and I just thought this project was a great way to bring both physics and environmental science—both of my interests—together,” she said. For Exline, Summer Research is a great segway into another environmental project. Two days after the program ends, she will travel to Turks and Caicos island, where she will take part in a field study on coral reefs in the area.